Setting up a HomeGroup makes it easier for members of the home network to share files and printers on a home network. This article will guide you on how to set up the network profile and HomeGroup settings on your Windows 8 or Windows 8.1 computer. NOTE: HomeGroup is available to Windows 7, Windows 8, and Windows 8.1 operating systems. You will not be able to add a computer with Windows XP, Windows Vista, or Mac OS X® to your HomeGroup. To know how to change HomeGroup and Sharing on Windows 7, click here. To find out how to set up the sharing capability for other Windows-based operating system, click here. 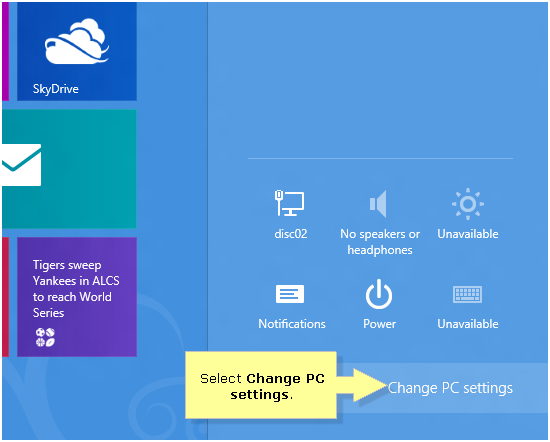 It is important that you only enable the sharing feature when your Windows 8 or Windows 8.1 computer is on a secure connection like work and home networks. When connected to a public network, it is highly recommended to turn this sharing feature OFF. On your keyboard, press the Windows + I keys to open the Settings charm. Click Network > Connections in the left panel. 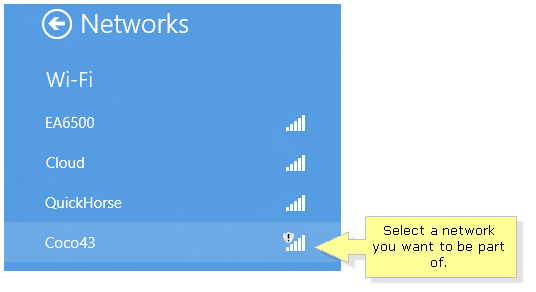 Once in the Connections window, click on your wireless network name below the Wi-Fi section. Under Find devices and content, position your cursor on the black rectangle and drag it from left to right to enable HomeGroup Sharing. On your keyboard, press the Windows + I keys to open the Settings charm. Once the navigation panel opens, click the Available wireless connection icon. QUICK TIP: If you are connected via an Ethernet cable, the wired connection icon will appear. On the list of available connections, select a network. NOTE: In the example below, the network chosen was Coco43. 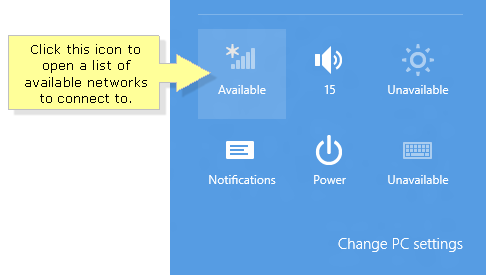 QUICK TIP: If you are already connected to the wireless network, right-click the wireless network name (SSID) instead then select Turn sharing on or off. Select the Yes, turn on sharing and connect to devices option. Click Network > HomeGroup in the left panel. Once in the HomeGroup window, enter the password for your HomeGroup in the provided field then click Join. QUICK TIP: If you are the administrator of the network and you wish to create a HomeGroup, click Create instead. Your HomeGroup settings will now open. On the Libraries and devices category, select a content to share. NOTE: In the example below, Documents was chosen. To enable the sharing, position your cursor on the black rectangle and drag it from left to right. Once done, the gray bar should turn sky blue and the Shared message should display. NOTE: You may do the same for all content within the Libraries and devices. On the Media devices category, enable the Allow all devices on the network such as TVs and game consoles to play my shared content option by dragging the bar to the right. NOTE: The devices must be connected to the main network to enable access to the HomeGroup shared media. On your keyboard, press the Windows + I keys to open the Settings charm. 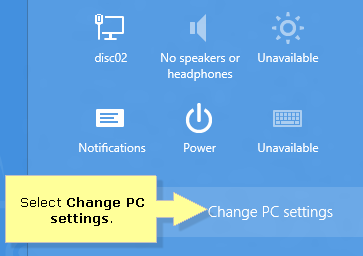 Once the navigation panel opens, select Change PC settings. Under PC Settings, select HomeGroup. 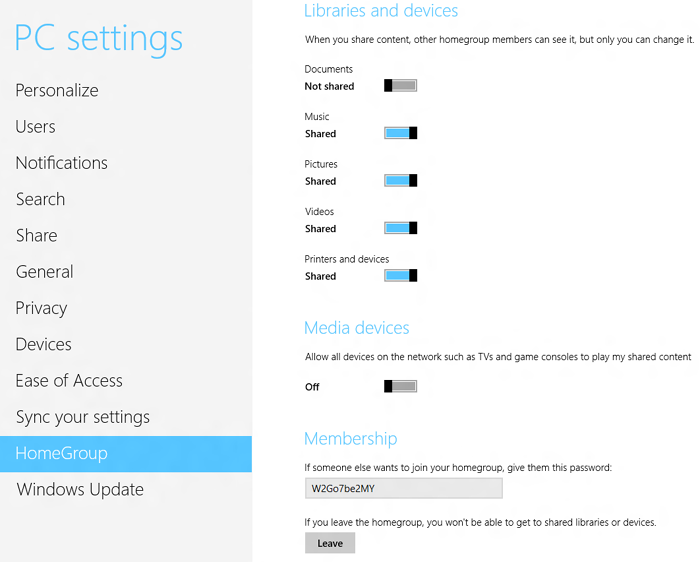 To start changing the settings of your HomeGroup, click Change sharing settings. You should have successfully changed the HomeGroup and Sharing Options of your network profile now. QUICK TIP: If you would like to add a device to join the HomeGroup, make sure to note the unique password provided in the Membership field.